It could help us keep craft in space longer than we thought possible. Researchers just test-fired a new type of ion thruster that “breathes” air, and one day, it could help humanity reach Mars and beyond. Better propulsion systems are key to advancing our space capabilities, and one of the most promising kinds is ion propulsion. 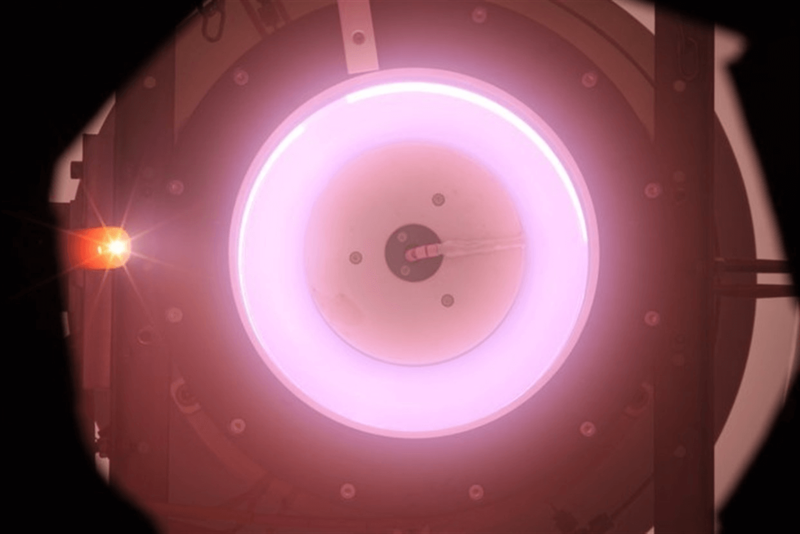 An ion thruster “ionizes” a propellant, most commonly xenon, by either adding electrons to it or taking electrons away. This creates thrust that can position a satellite or propel spacecraft, for example. Ion thrusters are much cleaner, safer, and more fuel-efficient than standard rocket engines. However, they are still limited by the amount of propellant their craft can carry. Scientists at the European Space Agency (ESA), Polish company QuinteScience, and Italian space company SITAEL hope to change that. The team has successfully tested an ion thruster that utilizes a method known as air-breathing electric propulsion (ABEP), or RAM electrical propulsion. That means it quite literally runs on air. While ABEP is not a new concept, the ESA’s prototype is the first of its kind. It works by sucking in air molecules from the top of Earth’s atmosphere. Then, it gives those molecules an electric charge and accelerates them. Finally, it ejects the ionized molecules back out into space. This ejection of ions is what causes thrust. After running a number of successful computer simulations, the team decided it was time to test their thruster in the physical world. The group set up a vacuum chamber at the SITAEL’s test facility in Italy to replicate conditions 200 kilometers (124 miles) above Earth’s surface. Through a series of tests, they proved they could ignite the system using solely an atmospheric mix of nitrogen and oxygen. “This result means air-breathing electric propulsion is no longer simply a theory but a tangible, working concept, ready to be developed, to serve one day as the basis of a new class of missions,” Louis Walpot, an ESA aerospace engineer, said in a statement. This “air-breathing” thruster may not be as powerful as some other ion thrusters in development, including NASA’s X3, but what it lacks in power, it makes up for in potential longevity. Because they can pull fuel from the air, these ion thrusters could expand our reach into space. A craft could travel from one atmosphere to the next, “refueling” at each before continuing on its journey. Instead of causing drag, air would become a fuel source. Of course, any long-distance trips would still take a long time, but at least we’d have the ability to eventually reach objects much farther away. Besides supporting future long-distance missions, these air-powered thrusters could be superior alternatives to the thrusters that currently help satellites maintain their positioning. Those systems eventually run out of propellant and can no longer function, as was the case with the ESA’s Gravity field and steady-state Ocean Circulation Explorer (GOCE) satellite. The ESA’s ion thruster could also cut down on the weight of spacecraft, which is a constant limiting factor for launches. The GOCE satellite, for example, carried 40 kilograms (88 pounds) of xenon for propellant. Getting rid of this weight could be a significant benefit to using these thrusters. While it isn’t the most powerful propulsion system, the ESA’s new ion thruster design has clear advantages over older designs. Eventually, it could become the propulsion system of choice for spacecraft engineers.